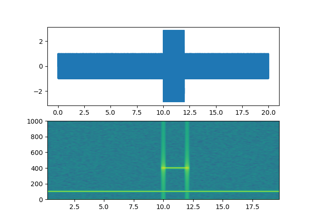 Compute and plot a spectrogram of data in x. Data are split into NFFT length segments and the spectrum of each section is computed. The windowing function window is applied to each segment, and the amount of overlap of each segment is specified with noverlap. The spectrogram is plotted as a colormap (using imshow). Array or sequence containing the data. What sort of spectrum to use. Default is 'psd', which takes the power spectral density. 'magnitude' returns the magnitude spectrum. 'angle' returns the phase spectrum without unwrapping. 'phase' returns the phase spectrum with unwrapping. The number of points of overlap between blocks. The default value is 128. The scaling of the values in the spec. 'linear' is no scaling. 'dB' returns the values in dB scale. When mode is 'psd', this is dB power (10 * log10). Otherwise this is dB amplitude (20 * log10). 'default' is 'dB' if mode is 'psd' or 'magnitude' and 'linear' otherwise. This must be 'linear' if mode is 'angle' or 'phase'. The image extent along the x-axis. The default sets xmin to the left border of the first bin (spectrum column) and xmax to the right border of the last bin. Note that for noverlap>0 the width of the bins is smaller than those of the segments. Additional kwargs are passed on to imshow which makes the specgram image. Columns are the periodograms of successive segments. The frequencies corresponding to the rows in spectrum. The times corresponding to midpoints of segments (i.e., the columns in spectrum). psd() differs in the default overlap; in returning the mean of the segment periodograms; in not returning times; and in generating a line plot instead of colormap. A single spectrum, similar to having a single segment when mode is 'magnitude'. Plots a line instead of a colormap. A single spectrum, similar to having a single segment when mode is 'angle'. Plots a line instead of a colormap. A single spectrum, similar to having a single segment when mode is 'phase'. Plots a line instead of a colormap. The parameters detrend and scale_by_freq do only apply when mode is set to 'psd'.